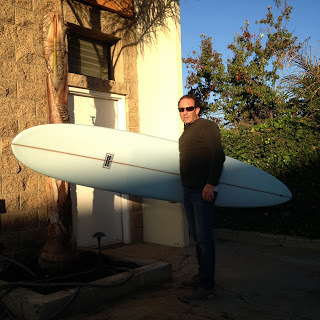 Customer Chris drove all day from San Francisco/Ocean Beach to pick up his new Nova Speedster. The Nova Speedster is what some would call a longboard semi-gun. It features a pulled-in nose (17″) and pulled-in tail (13-1/2″). Width at wide-point is 22-3/4″. The board is 3-1/4″ thick along the stringer, but the deck is crowned to maintain thinner rails. The bottom has a tucked rail edge, with low rocker throughout, slight belly in the nose, flat in the middle and moderate tail-V peaking in front of the 2+1 fin array. All the essential ingredients for pure speed in waves of consequence. A longboard semi-gun is not a board you’d find on the rack at your local surf shop. Contact me if you feel “the need for speed”.